This was the last morning hunt and the wind was really swirling. I met Matt at 6:00 AM while my family slept in. We went to blind 3 but did not last long there. The wind kept swirling and the hogs were growling just like last evening. Darn these are smart hogs! We left and tried a brush blind set up deep within the Ranch. I liked it immediately and before long hogs were coming down the trail. But the first batch winded me then ran up the trail growling. The second batch got a little closer then spooked as well. After the 3rd group busted me, I called Matt to let him know that this was not working and we needed to do something creative. 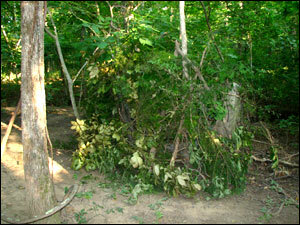 We discussed setting up an ambush. These hogs were extremely cagey as they entered a 50 yard perimeter of the blinds, but I had noticed that they were not nearly as aware when walking down the trails - leading to the blinds. So we decided to "trick" them by setting up far away from any blinds and wait them out without blinds or anything other than my Realtree Max-1 camo. After only 10 minutes of waiting, it worked - a group of hogs headed in. 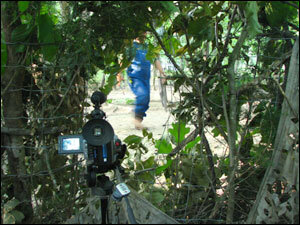 I had set up my video camera 15' behind me and set at wide angle. The intent was to catch both me and the hog in the shot. It worked perfectly - well, at least the camera setup did. A big group of hogs ran down the trail, I drew, but could not shoot because they were moving too fast. Then a lone hog walked up the trail toward my setup. I waited for the right angle, picked a spot, and shot. Damn!!! 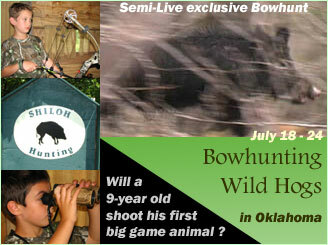 I blew the shot, it was high in the shoulder of the hog and I could tell the penetration was poor. There was a chance I hit something good, but it would be a slim one. I called Matt, who called cheryl to bring sage - the tracking dog. There was a decent amount of blood at the onset of the trail - but nothing to write home about. Unlike Patrick and Julie's hog, Sage's little bell kept dinging and dinging and dinging until we could barely hear it. Then the dog began to circle and come back - looking for the trail again. This was a bad sign. I continued down the blood trail - now mere specks here and there - while Matt watched the West road and Cheryl stayed with Sage. The little dog worked hard, but it was so hot that when he began breathing from his mouth he kept losing the trail. We found one tiny drop of blood (and my arrow) several hundred yards away. The hog was with another pack of hogs and it was obvious the hit wasn't fatal. After several hours, the three of us called the trail - Matt and Cheryl were convinced the hit was not fatal given the dog's ability to find bedded hogs, blood, and given the distance it had already traveled. I mentally kicked myself all afternoon - as we all do when we blow it. Upon returning to camp my two boys ran up to see if I got one. I showed them the video. My (now) cocky little 9-year old son Patrick Jr. says: "Aw Dad, how could you miss such an easy shot?" 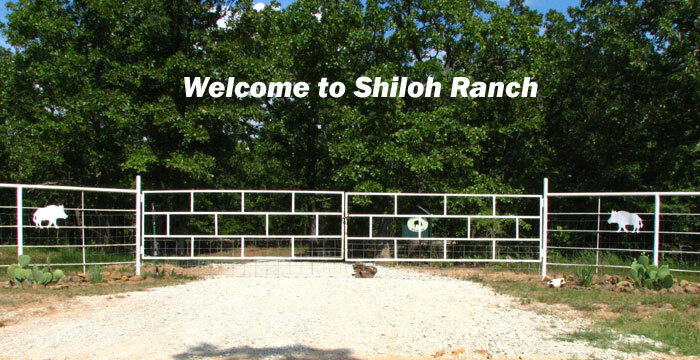 Shiloh Ranch has two comfortable, air conditioned cabins. 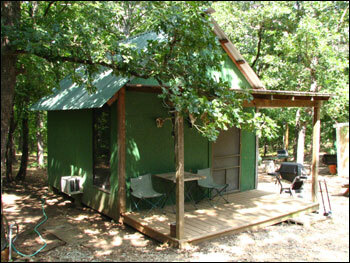 They have an outdoor shower, bathroom and a separate kitchen/cook cabin. 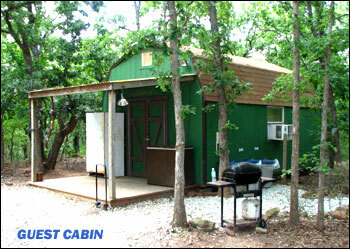 The cabins are equipped with electricity, a TV, table, refrigerator, sofas and 4 comfortable bunks for sleeping. 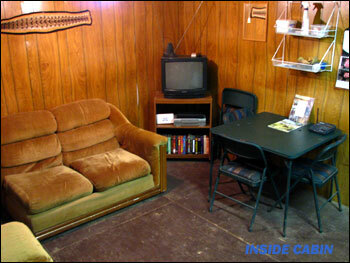 My family was totally comfortable there and are already setting dates for our return trip.